Mass Effect: Andromeda is a very pretty game in a very pretty series and I will take any excuse to gawk at it. 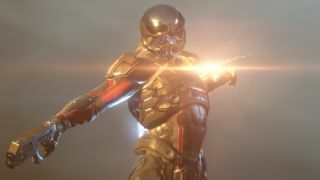 And if you feel the same, have I got good news for you: three new screenshots given by BioWare to Game Informer have been made public, and not only do they look lovely, but there's even a surprise or two to be found. Let's take a look. First up we have an image of the Nomad - Andromeda's answer to the Mako - driving across a desert planet. It's heading toward some kind of settlement stationed at that giant rock, though whether it's friendly or not isn't clear. If someone recognizes the insignia displayed on those banners, by all means chip in your theories. Next, we get a taste of how scanning will work. Those red outlines are pretty clearly enemies, so it seems that you'll be able to detect important things in the environment both in and out of combat. Scanning also works to help players boost their crafting skills by granting them materials and recipes. Lastly, and my personal favorite, is an image of Ryder using some sort of flamethrower ability. It's not clear if this is tech or biotic in nature (there's both a wrist-mounted device and some sort of blue glow near his hand), though I'd wager the former since we've never seen biotics be able to produce something like this before. In any case, it's cool as hell and I foresee plenty of people using this. Want to know even more about Mass Effect: Andromeda? Here's a handy compilation full of details.